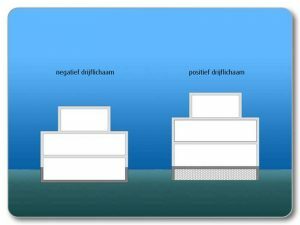 Floating houses can be divided into several types. The most oldest and most famous floating type of housing is the sailing ship which is also suitable for habitation made. These are typically barges which originally were used for transport, but at a later stage a permanent mooring and were mainly used for residential purposes. Almost always, these vessels with a steel hull that regularly have a yard for maintenance. The most common form in the Netherlands is the houseboat, consisting of a concrete shell with a typically build timber frame. These concrete structures have the advantage over steel hulls that they are a lot less maintenance, but are much less mobile. In connection with the current regulations in most locations in the Netherlands designs AquaTecture usually homes with this type of hull. The last time there was often built with the ‘positive buoyancy. This system is imported from Canada, and consists of a core of polystyrene (styrofoam), surrounded by a concrete reinforcement. On this type are also variants have been developed such as aluminum for example, the driving system of Aqualife. These systems have the disadvantage that the center of gravity becomes higher. In order to guarantee the stability captures this one generally by broadening the platform. The advantage of this system is that all the rooms are above the waterline, but for multiple construction layers to realize, the local rules allow a generous headroom.